The four lobes of the brain that can be seen from the external surface are 1) Occipital Lobe (vision), 2) Parietal Lobe (sensation & spacial perception) 3) Temporal Lobe (Hearing, Understanding, Identification & Naming) 4) Frontal Lobe (Movement, Expression, Planning, Personality, Self Control & Executive Function). The largest part of the cerebral cortex is the Frontal Lobe. It is the part of the brain that controls Attention, Movement, Personality & Thinking. People who have had strokes in the Left Frontal Lobe usually experience Depression (Robinson 1997). People who are depressed, often have lower frontal lobe activity. 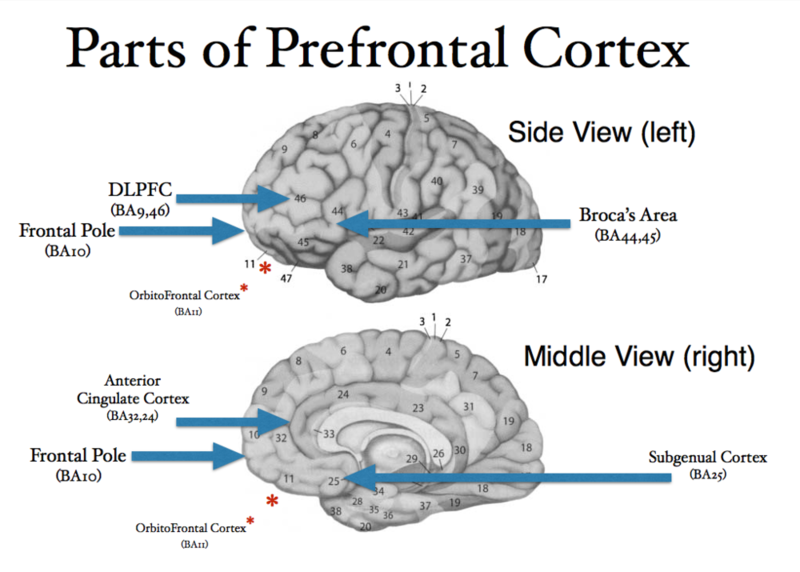 Without good frontal lobe function, people have difficulty with (working) memory, getting things organized, starting activities, paying attention, seeing the "big picture" and connecting with others in a socially appropriate way.